Jan Christensen is a great writer and friend, one of the first writers I ever really got to know. Her work is exceptional and she’s not nearly as famous (yet) as she should be. I hope you’ll enjoy our chat! Jan Christensen grew up in New Jersey and now resides in Texas. She’s had two novels and over fifty short stories published in various places over the last dozen years, two of which were nominated for a Derringer Award. Two other stories won a Fire to Fly award and the Mysterical-e 2000 Award for Best Story Previous to 2001. Jan writes a regular column for Mysterical-e about reading. PJ: Jan, how long have you been writing? Jan: A long time. A little over twenty years seriously. Before that, I’d write something then not write something for years at a time. Finally got down to it in the early 1990s. I joined a critique group, and that was a big help. More than the critiquing, the idea that I felt I had to have something to submit every two weeks upped my production tremendously. A little-talked-about advantage of critique groups, although some members, maybe even the majority, don’t feel that way. They probably should. Jan: I’m not sure. I think it was probably after I had more than ten or so short stories published. Then having a novel published by a small press in 2004 made me think that other people thought my work was good enough to publish, a validation which helped me feel at least somewhat successful. Jan: It’s way different. I expected to get some short stories published. Done. I hoped to get a novel published. Done. I hoped to get another novel published in about a year. Well, I had a contract, but the publisher went out of business, and the novel had been sitting with him for almost a year and a half. This was discouraging, to say the least. It slowed me down. I wrote some more novels, more short stories were published (an average of four a year), but I was spinning my wheels because I couldn’t get an agent. Then along came the Kindle and the acceptance of self-publishing. Now I feel as if I’m back in the game. I AM back in the game. But the rules sure have changed. Now I spend more time figuring out marketing than I do writing. But hope to turn that around in the next month or two. Jan: Afraid not. Not at all. But I do have hopes for the future. Jan: It hasn’t really. I see the steps more clearly now, though. Write, edit, publish, market. All different, but all extremely necessary to get where I want to go, which is getting a lot of books and stories out there. It means essentially that I need to work on three different projects at the same time. One, current work-in-progress. Two, edit something else. Three, publish (which includes having the third item edited by a professional, a cover made, and formatted, then uploaded). Then market everything like crazy. Jan: Once I decided to go for it, only a few months because I saw a contest for short stories in the Fort Worth Star Telegram. I pulled out a short story I’d already written not long before, cut it so it met the 1,000-word limit requirement, and submitted it. And won—not first place, but one of five winners. They’d had over 500 entries. There was that first validation. It was published in the newspaper, and I went looking for a writer’s group. But it took me almost fourteen more years before I got that book contract. I wrote and had published a lot of short stories before writing a second book (first one is hidden away), then a couple more, then submitting. Jan: Write more. Submit more. Sometimes I don’t submit anything for weeks on end. Not good. I still have short stories that need to find a home, many of which I wrote years ago. I’d love to have an assistant to do that. Submitting is my least favorite thing in the world to do as far as writing is concerned. It was bad enough when we had to do it via the post office. But with e-subs, the requirements about how to format the sub became more and more convoluted. It could take me an hour just to re-format something to submit to a non-paying market. Now that I rarely submit short stories anymore, I learned from a friend that he never reformatted. He just sent them in, and got them published. I laugh now. Why didn’t I think of that? Now I notice many markets just say, send it in such and such a file (.doc, .rtf, etc.) and are not otherwise particular. Much better, but there are also fewer paying and non-paying markets for short mystery fiction. Jan: My ideal day looks like this (but I rarely do it all). Write new material first thing every morning—go until I have 1,000 words down. Edit older material for an hour. Check for important email. Lunch, household and other stuff in the afternoons, and two hours after dinner for what I call “writing chores.” This is everything else to do with the job of being a writer. Submitting, research, blogging (my own and on others and commenting on other blogs), joining conversations on writer’s on-line groups, Facebooking, Tweeting, reviewing other people’s work, formatting, and some other things I can’t think of right now. Jan: You’d think it was getting that first short story or novel published, right? I had always hoped for that, even expected it. But I did a book signing at a Dallas library (thank you for setting that one up, P.J.—it turned out great!) soon after “Sara’s Search” came out, and when I walked into the room, people applauded. I was totally gobsmacked. I actually came to an abrupt halt and looked around the room. And told the group no one had ever applauded for me before. They grinned like crazy. We were a happy bunch after that. PJ: I wish I could’ve seen that! What is the single most disappointing thing that happened to you as a writer? Jan: When Quiet Storm, my publisher, went out of business. I knew a lot of the writers he published, too, so it was a huge disappointment for many people I knew. The publisher was such a great person, always trying to come up with things to help us sell our books, doing as much promotion as he could. Cutting edge POD back then. I think he was ahead of his time and probably extended himself and his finances too far and too fast. It was a real shame. Jan: I already mentioned the applause at the library signing. That was wonderful. The worst was I was taking a large suitcase of books down some stairs and pulled the rotator cuff in my shoulder. It hurt so bad, I couldn’t lift the case. A man helped me by taking it down the stairs the rest of the way. It had wheels, so I was able to get to the signing with it. But that shoulder gave me trouble for a couple of weeks, and after that it was very weak for a couple of years. Who knew writing could be dangerous? <grin> This is a cautionary tale for the other writers reading this. Jan: I’m not sure. I think it’s a toss-up between blogging, Facebook and Twitter. I think you need to do all three on a regular basis. Jan: All of it. <grin> But live performances are really tough, so I like social networking better. Jan: Okay. I’m only going to list my two novels, my short story collection, and four short stories that are stand-alone ebooks from Untreed Reads Publishing. You don’t want a list of my over 50 published short stories, I’m sure. <grin> That list is available on my website, if anyone’s interested. 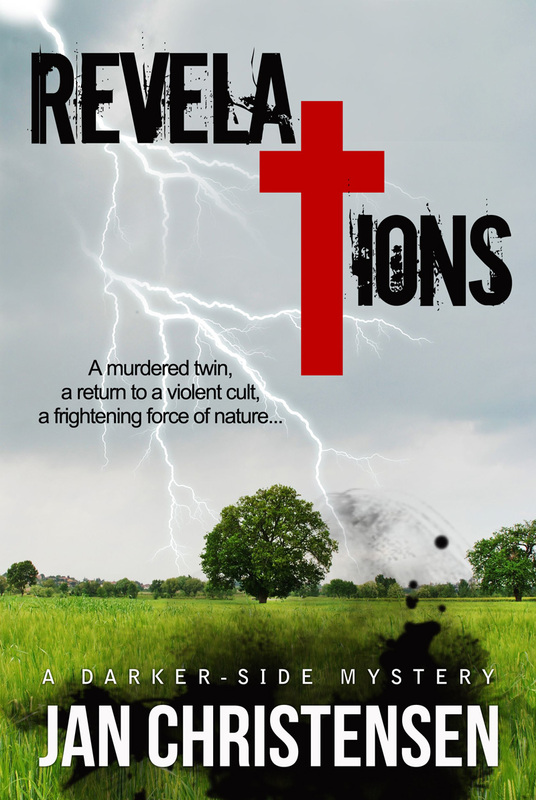 This is for “Revelations”: After a dark secret shakes Kirk Hudson’s faith, he escapes from the religious cult he’s been a member of for over two years. The night he arrives home, his twin brother is brutally murdered. Now Kirk must return to the cult to find out if the secrets harbored there caused his beloved brother’s death. Jan: I’ve told several people this, but I think it’s worth repeating. I have faith in my subconscious coming up with some great stuff without my conscious help. So, when I’m in draft mode, I simply let it flow. I take no credit for what that part of my mind is doing. I assume it comes from an accumulation of everything I’ve ever seen, heard, touched, tasted, smelled and learned. We all have a unique life. We all have stories to tell. Once I began to totally trust that the words would flow out of me, I let it happen. The real work comes in cleaning it up a bit. But I really don’t have to spend a lot of time doing that, either, usually (there are always exceptions). When writing your drafts, don’t second-guess yourself.. Let your imagination fly. You’ll be amazed about where it will take you. And your readers will thank you. Patti, thanks so much for having me on your blog. It’s a great place to be. Excellent advice, Jan! Thanks so much for sharing with us. Readers, if you haven’t already, this is one writer you’ve got to read. I’d love to hear your comments about Jan’s work! This entry was posted in Author interviews and tagged Amazon Kindle, Facebook, Fort Worth Star Telegram, Short story. Excellent interview with an excellent writer. Jan’s work is worth reading and her advice is worth following. I highly recommend her novels and short stories to anyone who likes good mystery. 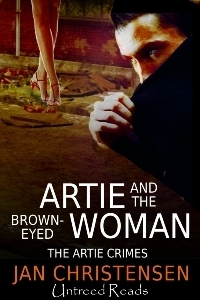 Gotta meet Artie soon! Great interview, and I agree fully about critique groups spurring production. Ours meets every two weeks and so, in my head, I, too, have a “ready to read two-week deadline for new writing. Thanks so much for commenting, Earl, Radine and Pat. Glad you liked the interview. Patti asks great questions, doesn’t she? Great interview. I always enjoy learning more about other writers and their processes.